It isn't civilized but neither are the bra-burners. The transgenders are on the verge of saving us from our morality, and instead of recognizing this golden opportunity, our right-wingers are busy crying about it. We were on the verge of putting women on the front lines without seeing how they'd do first as linebackers. 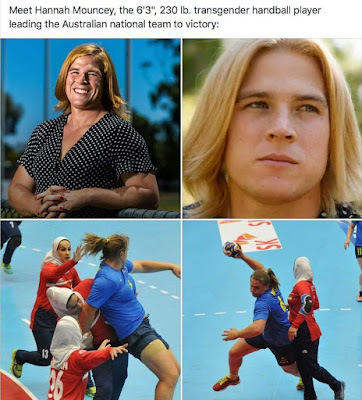 Now we have an opportunity to publicly bulldoze, trample, uppercut, choke-hold, and generally mangle our most obnoxious women into submission -- and we're throwing away the opportunity because some of us think this is less offensive than having them shot, captured, and most likely raped by a foreign enemy. Truth be told I don't care much for seeing grown men join girls' sports. It discourages our sane women from being athletic, which from every angle is a tragedy*. But I say give women a test run in men's sports -- and then we can decide what to do with the army. *A mass exodus of healthy women from sports would a national tragedy for the following reason. The densest concentration of beautiful women in any sport isn't in cheerleading, where their thighs are too thin and their breasts are too fake and their faces too painted, but in women's college softball, where the middle-class comprises the majority as God intended, and nature is at its fair-skinned and pony-tailed peak. I believe these are the most attractive women in the world, and worth a watch whether or not you enjoy the actual game. On the other hand, the densest concentration of ugly women in any sport is women's basketball. It can be described as the polar opposite of a beauty pageant. Pithy and politically incorrect, as usual. Loved it. Keep at it little man. Your time will come.